I drive home for my lunch hour every day for two reasons. 1. Most importantly, I go home to let my dogs outside and give the younger, and still crate-confined, pup a chance to run around before going back into the crate for the afternoon. 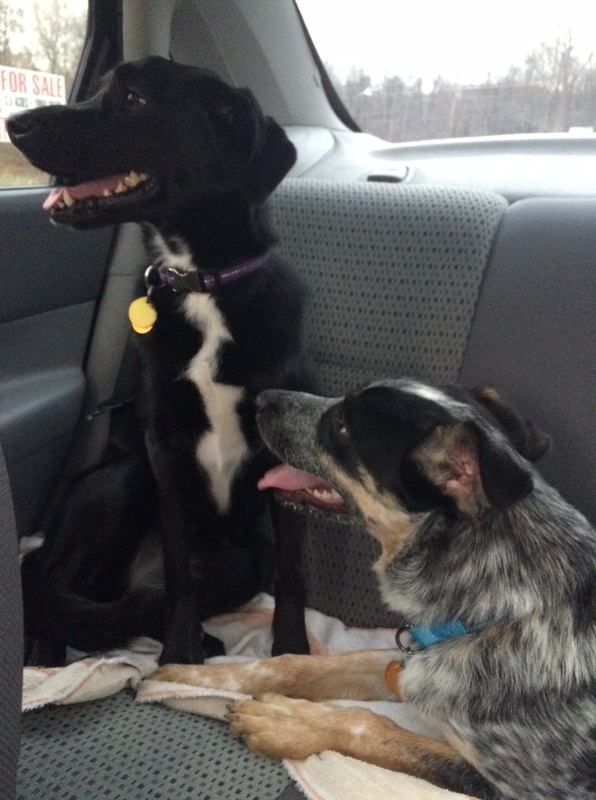 Here they are after our exciting trip to the dog park yesterday. Luna is on the left, Nova is on the right. I love these little creatures. 2. I like going home every day to be able to make a fresh, healthy lunch. Plus it saves money and gets me out of the office for an hour, which is a great mental break. Going out to lunch as a gluten-free vegetarian means that I’ll likely have to go somewhere more expensive, and there is still always the risk of gluten contamination, which is super fun to experience in the middle of the work day. Anyway, since I don’t have ages to make a feast, I do my best to make a quick, healthy lunch with fresh, primarily plant-based ingredients. I have a few regular lunches that rotate every few days. 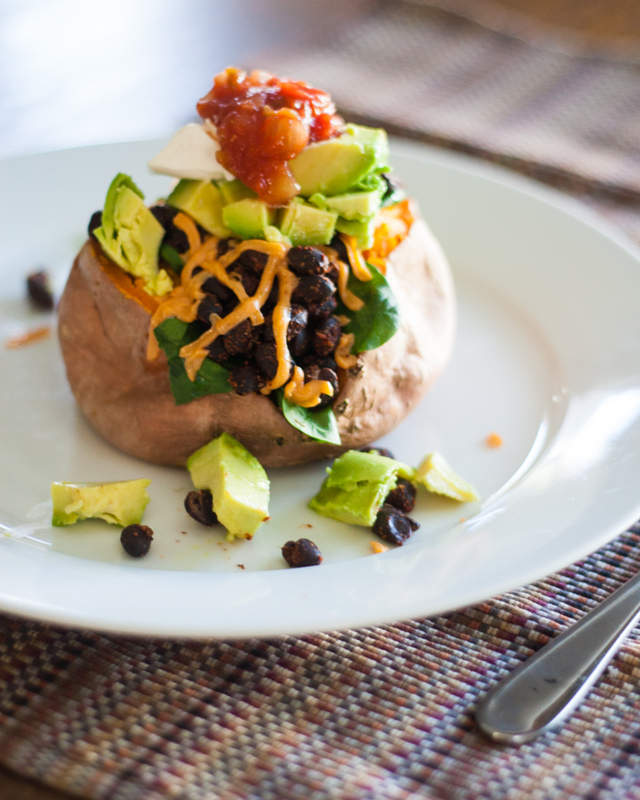 The Southwest Baked Sweet Potato is one of my favorites, and it only takes about 7 minutes to make. Scrub potato, and pierce a few times with a fork to let steam escape. Microwave on high 3-6 minutes or until tender. Rinse and drain black beans. Mix with garlic powder, chili powder, cumin, cayenne, and salt and pepper. Microwave for 2 minutes. Cut open the sweet potato and lightly squeeze the sides to break it up. Layer spinach, desired amount of black beans (I usually use 1/3 to 1/2 of the mixture and save the rest for tacos the next day), and cheese on top of the potato. Microwave for 30 seconds. 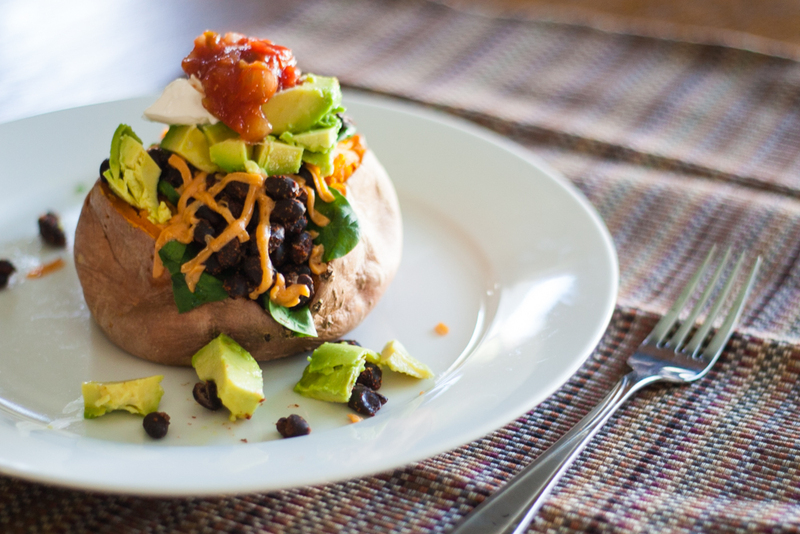 Top with avocado, sour cream, and salsa.